You are here: Home › Announcements and Listings › Conferences and other events › Materiality and politics in Latin America. We would like to invite scholars in various disciplines to join us in discussing the role of objects in the ways politics is conceived and practiced. An a priori temporal limit of these phenomena will not be imposed nor will any specific temporality of the issues analyzed privileged, but it is expected that the speakers who participate are able to stablish links between their presentations and present day reality of the Latin America’s contemporary outlook. Technologies for the transmission of ideas and political, state and critical propaganda. New shapes of the materialisation of the political being. Socio-political identities analysed in regards to the appropriation and the consumption of objects. The political agency of objects. New material forms of the Anthropocene. The deadline for the Abstract submitting is 31 July of 2017. 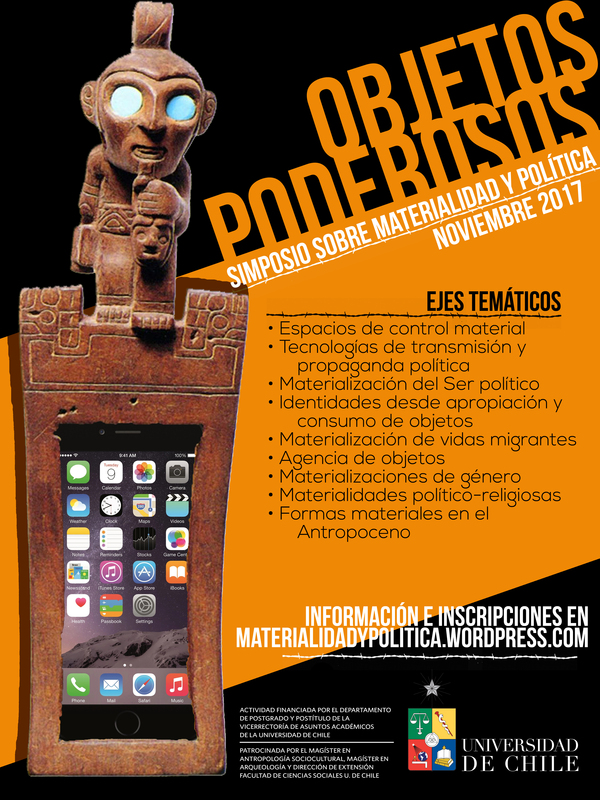 Event organized by the Master’s program in Sociocultural Anthropology and the Master’s Program in Archeology at the Universidad de Chile.